The floor standing New Condens high efficiency boiler is available in 11 models ranging from 69kW to 542kW with a total cascade capacity of 8,672kW. 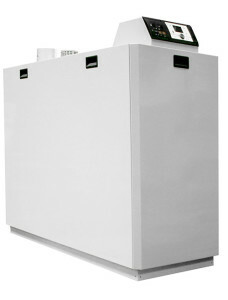 Many unique design features make this boiler highly energy efficient and robust, including a high quality Al-Si-Mg alloy heat exchanger providing high corrosion resistance and efficiency levels of up to 109.5% (NCV). The easy to use controller and optional cascade modules enable up to 16 boilers to be cascaded together and the controller also allows the boiler to be fully integrated into renewable heating systems.